Much like other similar home designs, the Industrial Modern style puts a premium on asymmetry and generous use of glass. Of all operating units, casement windows are your safest bets. They consist of a single sash that swings outward, acting as an excellent ventilator to keep indoor air cool and dry. Casement units have unbroken glass, which captures uninterrupted views and rays of sunlight. You might think twice before using them next to high-traffic areas like the patio, but they’re a must-have in finished, upstairs rooms. Renewal by Andersen of St. Louis admits that not all operating windows are as useful for egress purposes as casement units are. Narrow, floor-to-ceiling units feel at home with the Industrial Modern style. The combination of picture windows and sliding doors makes a beautiful glass wall that admits plenty of light and saves space. When applicable, Industrial Modern homes use oddly shaped windows. They don’t limit themselves to simple rectangular units, especially when there are architectural features that reflect complex profiles. Experienced home remodeling experts would recommend trapezoidal units to fill the clerestory of sloping roofs. Exterior-design savants also love using triangular windows to allude to prominent chimneys. In addition to types of unit, frame colors likewise are important when retrofitting windows to an Industrial Modern home. Fortunately, this architectural style allows for a wide variety of hues, wood species and stains. 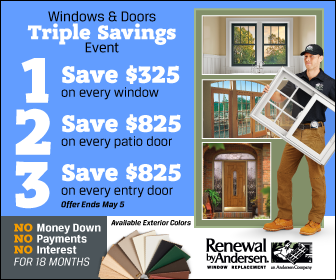 Get your window replacement done by Renewal by Andersen of St. Louis. Call us at (314) 332-2364 to schedule your consultation, and get a FREE estimate. We serve homeowners in St. Louis, MO, and other nearby areas.